Since its beginnings in 1996, the Chewton Domain Society has undertaken wonderful work, securing heritage places in the community, overseeing large conservation works on some of the town’s most precious buildings and preserving Chewton’s history so it remains at the heart of this small and thriving community. The organisation also produces the monthly Chewton Chat that promotes Chewton and its district, circulates local news and provides an opportunity for local organizations and businesses to promote themselves and their activities. The Domain Society also manage the annual Monster Meeting events. Chewton Domain Society has developed many innovative and effective ways to talk with tourists about heritage sites around town; they have made films featuring precious oral histories of Chewton as well as overseeing major conservation works to the Town Hall and then ensuring the building is available for community events and functions. The Heritage Council award will be presented by Stuart Macintyre, chair of the Heritage Council of Victoria in Chewton on 28 October. 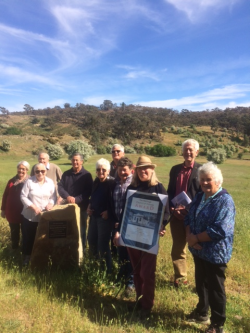 “The Heritage Council was impressed by the vibrancy of the Chewton Domain Society, its wide scope of activities and the innovative way it is looking at preserving and protecting the heritage of its community. We applaud their efforts with this award,” Mr Macintyre said. In addition to a framed certificate, the Chewton Domain Society have received a $2000 donation from the Heritage Council as part of the award. The Heritage Council of Victoria recognises community organisations that have made outstanding contributions to the preservation of the heritage of the state with this award. It is given out on merit and previous award winners include the See Yup Temple and the Dimboola Historical Society.